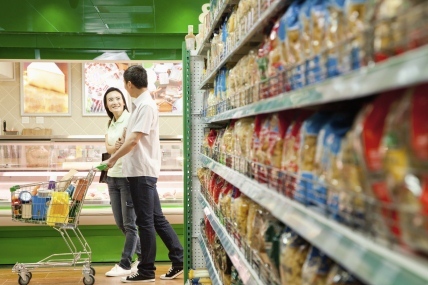 For the third consecutive year, Bain & Company and Kantar Worldpanel have partnered to study the evolution of Chinese shoppers’ behaviour in FMCG. Overall, behaviour remained stable over the past three years. However, some category leaders failed to sustain their position and lost share to others. 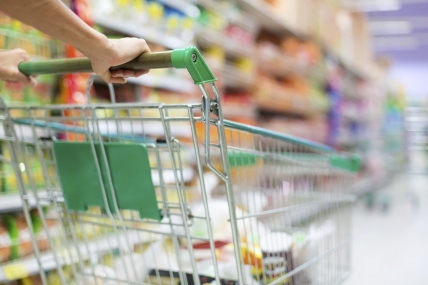 The winners adapted themselves to actual shopper behaviours, rather than try to change them. 1. Obsess over actual behaviours. Chinese shoppers demonstrate very low engagement with brands for most of the 26 categories we studied. The average purchase frequency for the top brands among the categories is less than one purchase every four months—a very low purchase rate. Yet low-frequency shoppers represent a significant percentage of each brand’s shopper base and contribute a significant share of its revenues. The shopper base for all brands remains a “leaky bucket,” as we found that the majority of shoppers left the brands we studied after two years. In order to compensate for losses, brands need to continuously recruit shoppers and this requires a deep understanding of actual behaviours rather than professed behaviours. 2. Clearly define the battlefield. Competition between brands is much broader and more complex than generally thought. To better understand which brands compete most closely with each other, brands need to clearly define their battlefields based on actual purchase overlaps across brands and categories. 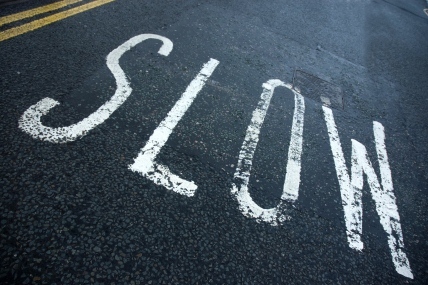 Narrowly defined segmentations mask the true nature of competitive dynamics. 3. Focus on penetration. 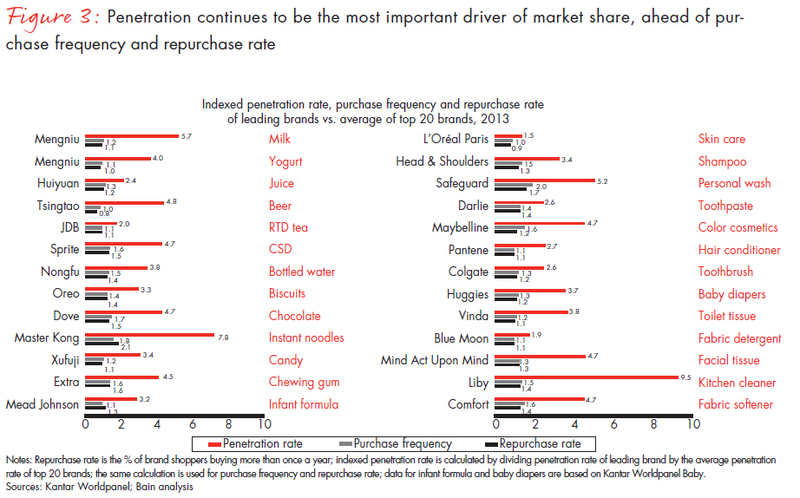 Consistent with earlier reports, gaining penetration is the key way that brands gain market share. Earning penetration requires continuous investment in three key assets: building on existing memory structure to get more shoppers to think about a particular brand as they shop, simplifying and rationalizing product portfolios to focus on critical “hero” SKUs that have the highest potential to win with shoppers, and perfecting in-store activation at the point of sale to ensure superior visibility and distinctiveness to make the shopper’s decision to purchase your brand easy. Success Story #1: Jia Duo Bao (JDB). JDB, a popular ready-to-drink (RTD) herbal tea brand in China, has enjoyed considerable success by capitalizing on the memory structure consumers have for its red-can package. Prior to 2012, JDB produced and distributed red-can products under the WangLaoJi (WLJ) brand. Following the termination of its agreement, JDB launched its own red-can brand, focusing almost exclusively on the red-can SKUs and advertising heavily with substantial in-store investments. By effectively building on consumers’ red-can memory structure, JDB sales grew 13% per year from 2011 to 2013 and further strengthened its leadership position with 25% market share. Benefiting from the red can memory structure built by JDB’s heavy advertising campaign, WLJ’s annual sales grew 60% from 2011 to 2013, mostly driven by its red-can SKUs launched in 2012. 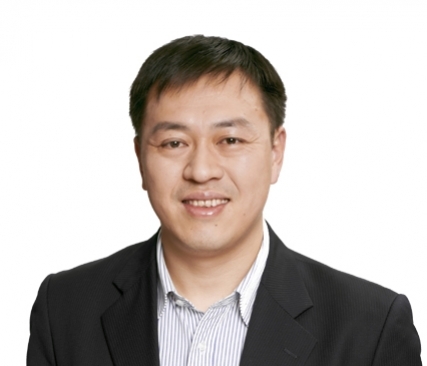 Success Story #2: YunNanBaiYao (YNBY). Established in 1971, Chinese brand YNBY was a famous traditional medicine brand. It was well-known for its anti-inflammatory benefits and ability to reduce bleeding. Since 2004, it has successfully transferred its established memory structure from traditional medicine to oral care. In doing so, it achieved success with a toothpaste that offered the same benefits as its medicine. Supported by smart investment in advertising and in-store visibility, YNBY gained market share over the last three years to reach 10.9% share value in 2013. Sales have grown 30% per year in the last two years. Success Story #3: Master Kong. Master Kong has built a clear and distinctive logo that exudes reliability and professionalism. The Master Kong logo, which was launched in 1992 when the company first introduced its instant noodles, features the image of a professional chef.Master Kong has successfully built on the reliable, professional memory structure of its well-known logo to not only increase penetration and market share in instant noodles, but to expand into beverages and biscuits. The company increased its advertising budget 65% between 2011 and 2013 and invested heavily in in-store assets, reaching a 56% market share in noodles in 2013. Total sales have grown 12% per year in the last two years and the company has gained 3.5% market share.